Here are two things that made me laugh in the paper today. (1) Simon Cowell announces that this year’s winner of Britain’s Got Talent will “perform in space”, as he adds a trip on the Virgin Galactic craft to the prize pool. If you’re a performer - a singer, a comedian, a juggler, a fire-eater - how does space compare with the Royal Variety Show, as a gig? Is it better or worse? I’m not sure the Royal Variety Show is the summit of performers’ aspirations any more. We never really believed they were more excited by that possibility than by simply appearing on Britain’s Got Talent. People always muttered that nobody watches the Royal Variety Show any more. Even the Queen doesn’t go. Thus, doesn’t sending the performers to outer space feel a bit satirical ? Meh, what difference; Royal Variety, outer space, much of a muchness. Off they go, into the BLACK SILENCE. As a metaphor for what usually happens to reality winners when the TV series ends, it’s a little… biting. (2) David Cameron tells Now magazine that he loves to take his wife Sam out for dinner on Valentine’s Day “if he remembers to book a table early enough”. Oh yes. Because if David Cameron didn’t remember Valentine’s Day until, say, February 13th, he’d never get a table anywhere. They’d probably have to queue at McDonalds. It’s just another way in which David Cameron is exactly like the readers of Now magazine. Do you think people fall for it?! do we think people fall for it? sadly yes. when Tony Blair was doing the same “man of the people” routine,he claimed he remembered going to watch geordie legend Jackie Milburn at newcastle, a player who finished playing before he was born! Politicians are all bullshitters. hilary clinton recalled being under fire at an airport in yugoslavia, until tv footage of the event showed otherwise, she said “i misspoke”. You can count honest politicos on the fingers of one hand, one hand of a twice convicted thief in saudi arabia! the odd stray honest one remains on the back benches, where they can’t do any harm. It’s Simon Cowell’s vanity that disturbs me. All teeth and hair. On a typically soaking wet Manchester day he wears sunglasses to the auditions due to lack of sleep. Due to his vanity more like. They’ll all be singing “Rocket Man”, “Like a Virgin”, and “there’s a space for us”. Meanwhile “fly me to the moon” will be banned on grounds of cost. Also, I don’t want to seem too stupid, but isn’t BLACK SILENCE just a tad racist, with the additional danger of offending the deaf (not that they’d ever hear of it). It might well describe the now (thankfully) out of favour “Black and White Minstrel Show”. Not everyone. Unfortunately enough do to make it a problem. Nick Clegg being one who springs to mind. Have to say It was a pleasure to read your column in the Observer on Sunday. You were on good form. As someone who’s seriously considering standing at the county council elections in May, all this talk about honest politicos is concerning. I have never been to a football match in my life, and never considered making up anything at all about seeing particular players. Perhaps I don’t have what it takes? I have, however, walked through a minefield and survived, so maybe there’s an ‘on the other hand’ to all this? As for booking a table for Valentine’s Day, McDonald’s is a rotten idea. Pizza Hut is miles better (unless they’ve stopped letting people go back for more, whenever they feel like it)! Yes, David Cameron is a [MOD: EDITED HERE…]. I also like the space observation. Very good. 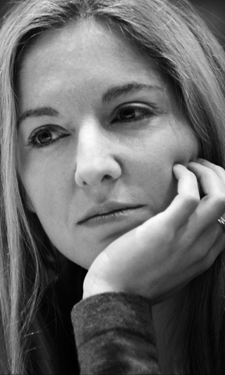 I like you Victoria Coren, we should be friends. You are snarky and feel like you come from the docks, but in a nice way. It’s a Christmas cracker level joke, I know, but it gave me a bit of a laugh, so thank you for posting the original. I hope you don’t mind (well, now you can let me know if you do). Did you take the original picture or are you inside the horse?